Every jewelry lover loves to have different types of jewelry in their jewelry collection. And floating lockets are the most popular item among them. For jewelry, Pandora is the first choice for their collection, unique design and availability. You can find them both online and offline easily. If you’re planning to get a floating locket for your nearest one, Pandora is the best choice. But sometime you may get confused or in a hurry to choose the best one for her from their large collection. That’s why I’ve tried to shortlist some of their top-rated lockets in this buying guide which may help you to choose in no time. Material: sterling silver and white cubic zirconia. A simple circular hollow pendant with white cubic zirconia around it. The pendant is penny-sized and can be opened to put any assortment. Three letters ‘M’, ‘O’ and’ ‘M’ is included in the packaging. All the letters are made of sterling silver and embellished with white zirconia. It is a great gift for your mother, mother-in-law or any mother figure of your life. This pendant comes with a silver anchor chain. For mother’s day of your mother’s birthday, show your love and respect to your mother with this beautiful floating pendant. She may love to wear it every day as it will math with daily wear outfits. Material: sterling silver and Sapphire Crystal Glass. This beautiful floating pendant belongs to ‘vintage seduction’ of Pandora. It is a simple penny size hollow pendant with ‘PANDORA’ signature all around. This locket is closed with glass on both sides and can be opened. A spiral chain comes with this locket. It is a beautiful chain for everyday wear. You can have it for your self or as a gift for a loved one. You can make it more memorable by placing a photo in it, or any Swarovski crystals. Crystals of vibrant colors will make this pendant more noticeable. The attached chain is long enough to sit the pendant on your cleavage. This locket is a true vintage themed locket and from the ‘Vintage Seduction’ collection from Pandora. 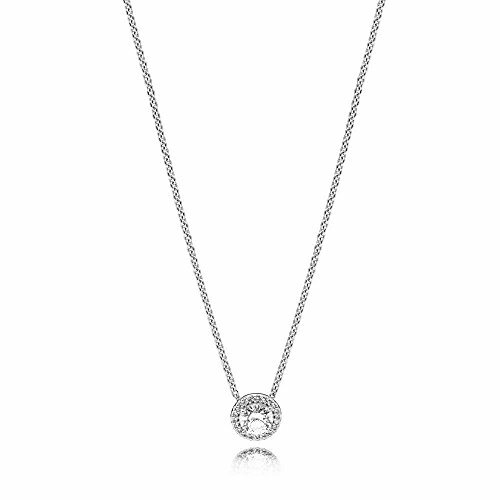 It is a sparkling pendant pave with cubic zirconia all around its perimeter. A square is placed in the middle, that is also paved with zirconia. This package includes a spiral silver chain and the locket is fixed with the chain. This necklace is long enough to sit on the collarbone. It is a glittering gorgeous locket that will look good with an elegant outfit on dinner parties or daytime wedding. This locket will accentuate the wearer’s face beautifully. It can be a pleasant surprise as an anniversary gift for a loving wife. Material: sterling silver, Sapphire Crystal and white Zirconia. This is a super-simple floating heart-shaped locket with sapphire glass on both sides. There is no signature or embellishment in this locket. A thin anchor style chain comes with this pendant. 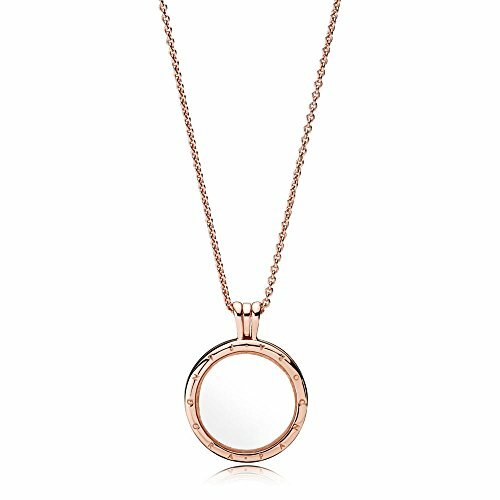 This locket is for minimalistic people, as it has a minimal design on it. I don’t prefer this piece fo jewelry to give anyone as a present, it is too simple for that. But it is good for daily wear. You will always be able to beautify this locket as you like with proper embellishment or birthstones. 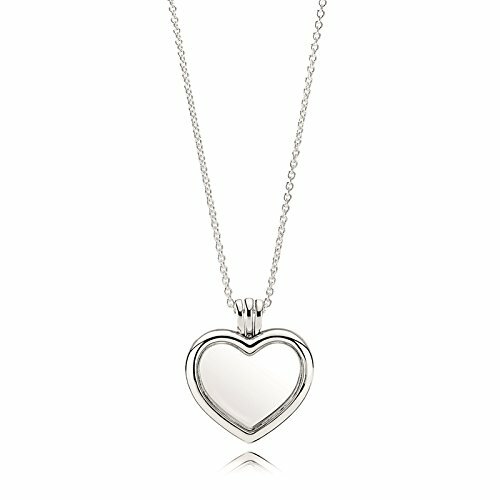 It is a fixed-locket necklace with a hollow heart pendant. The heart is paved with zirconia on its border. The chain is an anchor style simple chain with adjustable length. It is from ‘Valentines’ collection of Pandora. Please note that it is a hollow necklace, without any compartment. If you are looking for a beautiful necklace as a present but confused about fitting it on your girlfriend’s neck, then it is wiser to choose one with adjustable length. That way, not only she can wear it as she likes, but also wear that necklace with outfits of different neck designs. 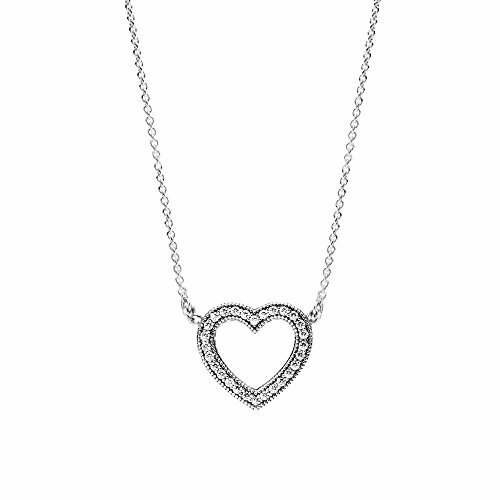 This heart necklace will enhance anyone’s face and will add a romantic vibe to the outfit as well as emotions. Material: rose gold plated sterling silver, Sapphire Crystal and white Zirconia. 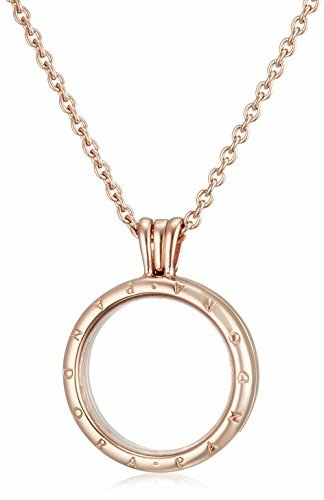 This is a sterling silver necklace with 14k rose gold plating on it. This necklace is from ‘Vintage Seduction’ from Pandora. It is a thin chain with a floating round pendant with Pandora signature on it. Both sides of this pendant are enclosed with sapphire glass and it can be opened. To add some warmth to the look, a rose gold piece of jewelry works wonder. This necklace will make any woman look stylish and luxurious. 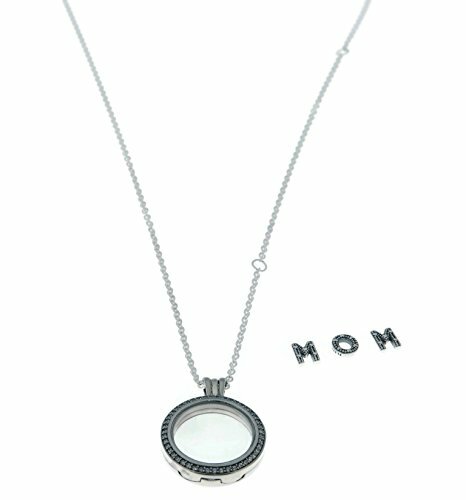 The tiny see-through compartment of this locket is for adding petite from personal collection. It can be left as it is, to make this locket simple yet elegant. Even the simplest outfit will look extraordinary with this necklace. It is plated with 14k rose gold, so, there is less chance that this piece will tarnish over time. Another variation of hollow heart floating locket necklace, which is not fixed to its chain. This heart locket comes with sapphire glass closer to make a tiny compartment so that any special piece of memento can be added to the locket. The locket itself is beautiful because of the glittering white zirconia stones all around the border. Make your gifts more meaningful by adding pieces of tiny crystals, gems or pearls to it. This locket is meaningful and pretty as it is, and it lets you add any embellishment of your choice to it. The chain is long that the locket will be placed on the cleavage. This piece will best suit with high neck dresses or shirts. It is not adjustable, but it surely will make anyone prettier. Material: sterling silver, sapphire crystal, and white Zirconia. 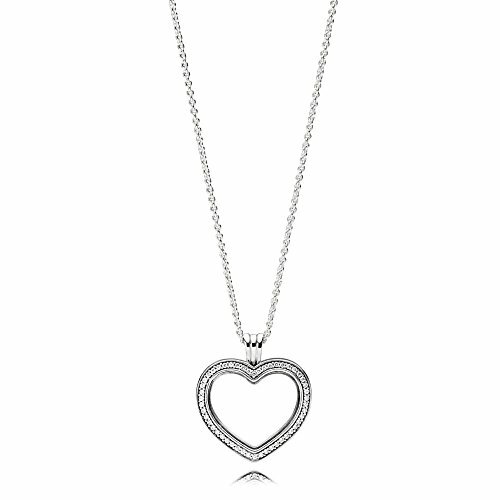 A heart-shaped key is used as a locket in this necklace. There is cute detailing on the head and end of the heart-key. The heart shape is like other floating lockets we have reviewed, a little zirconia-paved heart with sapphire crystal window. 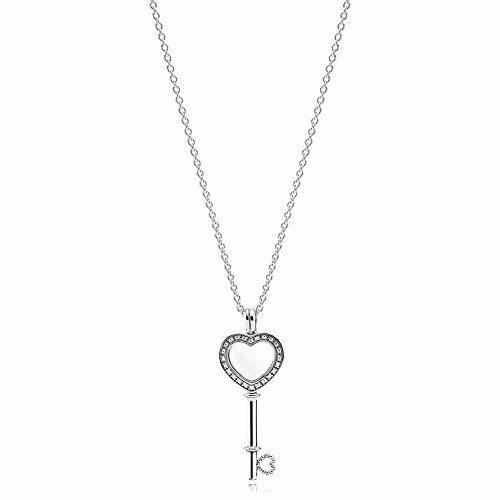 There is another tiny heart at the end of the key, made from sterling silver microbeads. The inner meaning of this pendant is, ‘the key to your heart’. You can create any other meaning based on your very own experience. The crystal window is for placing meaningful objects to recall sweet memories of beloved ones. The included chain is longer than other necklaces. It is a cute pendant to wear for young girls. The best utilization of this locket will be giving as a valentine/ birthday/ any memorable day of your love story. Material: sterling silver and sapphire crystal. The most unique floating locket of this list is this Mickey floating locket. 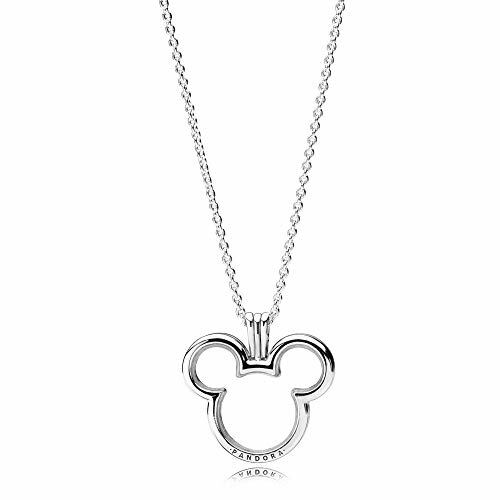 It is a sterling silver Mickey shaped frame with sapphire crystal on either side. There is a pandora signature at the lower part of the floating locket. This locket comes with a long chain. 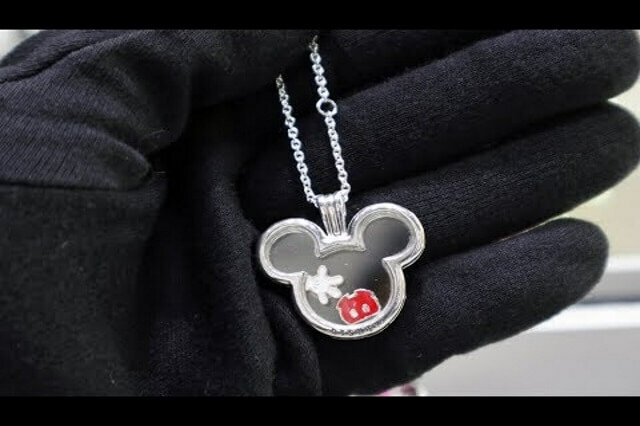 For girls and ladies who have an obsession over Disney or particularly mickey mouse, this locket is a gem. It lets them carry their favorite childhood character always with them. Besides, tiny crystals can be added to this locket to make it more special. As a gift, it is a perfect present for birthdays of friendship days. The chain is very long, it will let the locket hang beyond cleavage. So be sure before ordering it. 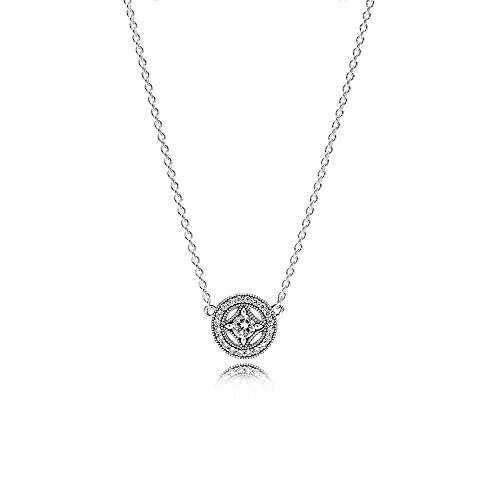 This pendant is from ‘Timeless Elegance’ collection of Pandora. It is a fixed-pendant necklace. The pendant is a large round white zirconia, enclosed with tiny zirconias all around. The included chain is adjustable to three different sizes; 45 cm, 42cm and 38cm. This pendant truly is elegant and timeless. It can be worn at any age and it will give anyone an elegant look on any occasion. The pendant is a super-sparkling one and draws attention easily. Such elegant jewelry pieces are the perfect gift for mid to old age women. Show your affection to them with this present. This piece will look best at any daytime party. With the adjustable length, you can play with the necklace. Besides, one piece can be worn by ladies of different generations from the same family. A locket is the most common jewelry item to everyone. Generally, by the term, we understand a piece of ornament which we wear on chains. Or you can say, the locket is a type of pendant which has a space to store photograph or other small memorable pieces of your dear one as a sign of their true feelings. Because usually lockets are given as a gift to loved ones on occasion of valentine’s day, birthday or any kind of anniversary. Lockets are come in many shapes like- circles, ovals and hearts and made with precious metals- gold or silver and stone. There different types of lockets are available in the market. 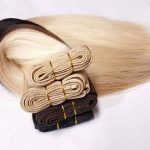 Some are regular types and available at any jewelry shop and sites like Pandora and some are vintage and can be found at antique shops and some online store like Amazon and eBay. A keepsake locket has a room for a small photo behind a plastic cover or it may have a glass enclosure for placing a lock of hair or any other memorabilia. This type of lockets is the most popular among any other locket. Centuries ago, lockets were made with small filigree style openings in which you can store perfumed fabric pieces to cover up any type of unpleasant odors. Usually this type of keepsake lockets feature Daguerreotype photos. It was first introduced in the year 1839. In this process, a soft metal daguerreotype is reduced in size then set & sealed behind the glass. Mourning lockets have become popular in England during Victorian Era. There's the possibility that after the death of her husband the Queen was in deep mourn & wore locket that contained a little piece of a daguerreotype of Prince Albert & a lock of his hair and this started a trend. Floating charm lockets & engraved discs became popular in recent days. And you’ll find tons of options for choosing from to buy floating lockets, charms and engraved discs. If your dear one is going to celebrate her first Christmas as a mother, you can make this moment memorable to her by giving her a Pandora floating locket with a nice pic of the newborn. This can make her feel special with her baby. If you’re looking for a gift for a newlywed or engaged couple, floating charm locket collection of Pandora can be a great choice. Even if it is your first valentine day or her birthday with your wife after marriage, the floating locket is the most beautiful way to celebrate the occasion. If you’re planning to give your dear one a lovely gift whose spouse or child or any other family member serving overseas, a locket with him/ her is the best gift option for her. Whenever they miss their family member, the locket can make them feel that they with family always. It can be also a great gift option for the soldier. Grandparents are the most precious member of a family. They always love to be with their grandchildren or family. But most of the time we can’t be with them for other purposes. So we can give them a floating locket as memorabilia whenever we are not with them, specially it’ll help your grandma. Now its turn about your little girl! The smile of happiness on her face makes you the happiest person in the world. Pandora floating charm locket gives you the option to make her feel that she is the special one for you. This information may help you to buy the perfect locket for your dear one. A nice and beautiful locket can be the greatest gift to her with a proper photo or other memorabilia. And Pandora has a huge number of collection to choose from. You can also choose your one from Amazon. Or if you’re a little bit confused about choosing the perfect one from their huge collection, you can go through the top 25 list I’ve mentioned above. I’ve tried to include almost every type of locket to choose from. So get your one and make her feel special.